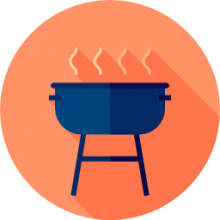 Portable gas grill are on-the-go cooking solutions and even solid replacement options for traditional backyard grills (Source). They connect to propane canisters and you can even cobble together connections to propane supplies in RVs using a hose and adapter set (Source). The lightest weight option is the 10 lb Char-Broil, while the 44 lb Coleman grill is the heaviest. The stainless-steel Smoke Hollow provides the largest cooking surface area at 305 sq. inches. Some options can function as tabletop' grills. The Smoke Hollow is a dedicated tabletop, while the Cuisinart has long retracting legs that fold up to function as a standing or tabletop portable grill. Buyers say that the Weber grill is more of a 'broiler' option- even though it's marketed as a propane grill. This Cuisinart portable gas grill has a 145-square-inch grilling area with foldaway legs for transport and storage convenience. It's capable of handling 8 steaks, 6 to 10 chicken breasts, 8 hamburgers, or 4 pounds of fish at once. 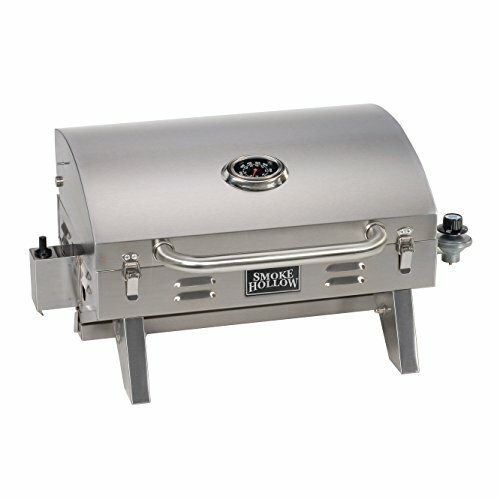 It features a 5,500 BTU stainless-steel burner and an integrated briefcase-style handle lets you transport this 13.5 pound grill. 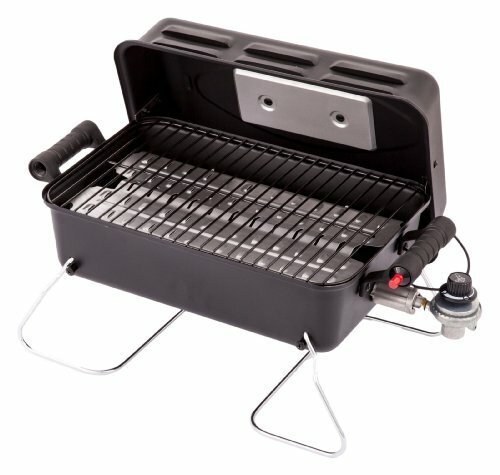 The Char-Broil Portable Propane Grill 3.6 $ 187 - 190 sq in (2 size options) 10 lbs. The Coleman Road Trip Gas Grill 4.4 $$$ 285 sq in 44 lbs. The Smoke Hollow Stainless Steel Tabletop Gas Grill 4.2 $$ 305 sq in 20 lbs. This standard gas grill offered by Char-Broil is easy to clean, light, and an excellent choice if you’re going camping. Users love the heat-resistant handles, but some do note that they had issues keeping it lit. The Char-Broil tabletop grill measures 24″ x 12″ x 15″, and it’s made of quality steel with a durable, high-temperature finish to prevent rusting. Another great thing about this portable gas grill is that you can cook up to 8 hamburgers at once, thanks to the 187 in2 chrome-plated grate. The grill also features foldable legs, 11,000 BTUs of cooking power, and a weight of 10.3 pounds. It works with 16.4 oz or 14.1 oz propane cylinders. A buyer comments that he has used this portable propane grill to cook burgers, pizza, steaks and more and that he had never had any issues with the heat. He adds that the grill has survived numerous family trips and that it’s sturdy and stable. Another happy customer observes that it’s not very difficult to put together the grill and that you can fit four large steaks on it. He highly recommends it as the best portable gas grill. A purchaser states that the push button igniter is very handy and that the propane grill cooks evenly. However, some customers have said that the grill can’t generate enough heat and that it’s cheaply made. Some users also note that it worked only for a couple of times before it broke. If you’re searching for a top-notch grill for camping or road trips, you might take a look at this portable propane grill by Coleman. Users love the interchangeable cooktops, but some do note that it’s expensive. The Coleman road trip grill features 20,000 BTUs of cooking power, a large cooking surface, two cast-iron grill grates, a Perfect Flow pressure control system, and a sliding side table for keeping ingredients close at hand. Another great thing about this portable gas grill is that it’s easy for transport due to the collapsible stand with wheels. You can use only 16.4 oz propane cylinders with this grill. In general, users have a high opinion of the Coleman portable gas grill, and they agree that it’s one of the best camping grills available. An online reviewer observes that the propane grill is easy to clean and that it fits in a car trunk with no problems. He adds that he was very surprised how quickly the grill folds and unfolds and that it doesn’t take much space. Another customer states that this road trip grill is well-made and that it gets very hot so that you can have burgers in less than 10 minutes. A user also comments that he is very impressed with the quality of the foldable propane grill and that it provides plenty of cooking surface. However, a couple of purchasers have said that the grates got rusted quickly and that the wheels are not durable. Some users also note that they had a problem with the gas. This portable stainless steel gas grill offered by Smoke Hollow is large, easy to transport, and suitable for every barbecue fan. Users love the compact design and the power of the grill, but some do note that they had issues with the igniter. The Smoke Hollow tabletop measures 26.5” x 12.2” x 16.5”, and it features 305 in2 of cooking surface, 12,000 BTUs of cooking power, legs that fold for portability, and a weight of 22 pounds. Another great thing about this stainless steel grill is that it has a locking hood for transport and storage. You can use one pound propane cylinders with it (not included). A reviewer shares that the tabletop gas grill works far better than he expected and that it heats quickly and cooks the food evenly. He also says that it’s easy to assemble it and that it’s a piece of cake to regulate the cooking temperature. He highly recommends it as one of the best stainless steel propane gas grills. Another buyer comments that he has been using the grill for six months and that he doesn’t have any complaints regarding its functionality. A user observes that the grill lights up on the first attempt and that it’s easy to clean it. However, some users have said that they find it difficult to control the temperature. Some users also note that the package didn’t contain all the necessary hardware and that it’s not very easy to assemble it. This gourmet tabletop gas grill offered by Cuisinart is well-made, powerful, and well-designed. Users love that the grill is easy to move around due to the compact size, but some do note that it tends to flare up. The Cuisinart portable propane grill measures 13 x 16.5 x 16 inches, and it features a grilling area of 145 in2 so that you can cook up to eight steaks at once, foldaway legs, a 5,500 BTU stainless steel burner, an even-heating porcelain-enameled grate, and a weight of 13.5 pounds. 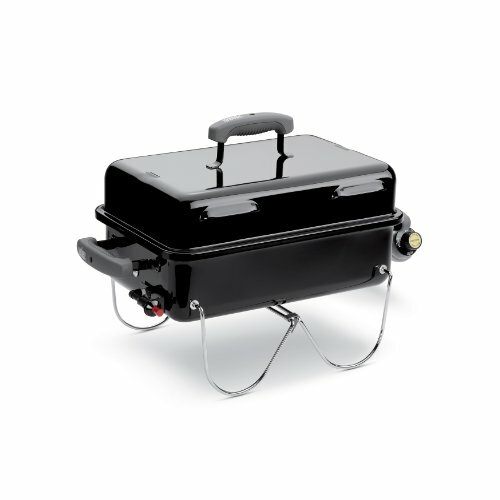 Another great thing about his grills is that it has integrated lid lock and a briefcase-style carrying handle. A customer mentions that the tabletop portable gas grill is a perfect addition to his patio and that it folds very quickly. He says that you can take it everywhere you go and that it doesn’t take much time to assemble it. Another reviewer observes that the grill is easy to clean and it heats almost immediately. He adds that the grill stays hot even in windy weather and that it’s ideal both for the beach and camping. A user also notes that the portable gas grill cooks his burgers evenly every time and that he doesn’t have any complaints regarding the performance of the grill after a couple of months. However, some users have said that the grill doesn’t last very long and that there are too many plastic components. Some users also note that they had issues with the burner and that the legs are not stable. This portable gas grill offered by Weber is affordable, easy to carry around, and ideal for campers, tailgaters, and road-trippers. Users love that the grill is powerful, but some do note that the grate is problematic. The Weber go-anywhere grill measures 14.5 x 12.2 x 21 inches, and it features a 160 in2 of cooking area, a steel burner that produces 6500 of BTU per hour, and a tuck-away lid holder which is great because you can check on the food. 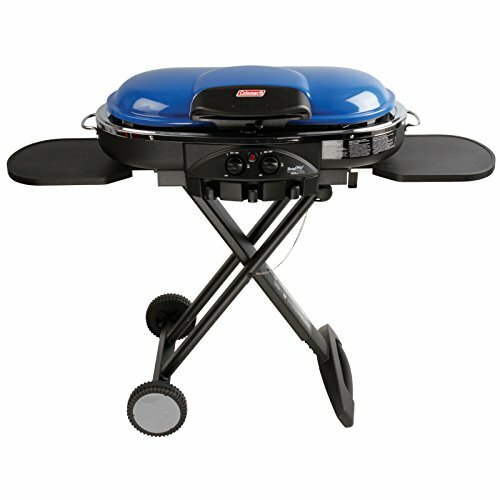 This grill also features porcelain-enameled steel cooking grate, a push-button for ignition, and a weight of 13.5 pounds. You can use disposable 14.1 oz cylinders. A customer mentions that the Weber gas grill cooks his burgers perfectly and that he doesn’t have any problems controlling the temperature. He says that the grill is ideal for 2-4 people and that it’s stable and sturdy. Another user shares that he uses the small portable propane gas every day and that it takes five minutes for the grill to heat. A user states that the grill is perfect for fish, burgers, and steaks and that it’s a piece of cake to assemble it. However, a few customers have said that the new design of the Weber grill has numerous flaws and that the food doesn’t get cooked well. Users also note that they had problems with the lighter and that it’s difficult to clean it. The first portable gas grill be examined is manufactured by Char-Broil- it's designed for truly mobile and portable grilling with legs that fold over the top and lock the lid in place. Another handy feature, because its handles are heat resistant, you don't need to wait for them to cool down if you're looking to pack up camp quickly and leave the grounds. It provides 190 in.² for its cooking surface with an 11,000 BTU burner that's compatible with 14.1-ounce and 16.4-ounce propane cylinders. It's advertised as a convenient option for tailgaters, campers or just people in the backyard who lack a dedicated outdoor grill. Buyers tell us that you have to be careful shielding the grill's flame from strong wind because some reviewers criticize it for snuffing out at even slight breezes. The difference between the standard and deluxe models is that the standard is a little bit smaller at 187 in.² as opposed to the deluxe which is 190 in.². The deluxe does also come with a pushbutton ignition. Some buyers purchased it so that they could use it on their balconies or fire escapes and crowded urban areas- saying it's a handy option that enables them to cook outdoors during summer months. Another buyer tells us he has grilled pizzas, corn on the cob, hot dogs, bratwurst, and hamburgers, saying that the medium setting was most effective- he also praised how portable it was for family trips throughout the domestic United States. Another reviewer says that in terms of how much it can cook at a time, they were able to fit 4 steaks on it- and commend its inexpensive price and solid quality. Some reviewers have complained that recent models have declined in quality and are just not as durable as they used to be. Overall, you should be aware of prior to purchase that it will take some assembly to put it together- so make sure you have a screwdriver handy whether you are camping or tailgating. Another tip from an experienced user is that when working with hamburgers, you should lay out some aluminum foil on the grill cooking surface, spray it with some Pam, and then lay the hamburgers on it. The second portable propane grill we examined is manufactured by Coleman- it comes in a range of different color options that include maroon, orange, green, blue, silver and black. It's marketed as a solid option in cold environments on account of a proprietary pressure control system that provides study heat. It has 20,000 BTUs with each burner having 10,000 BTUs and a spacious cooking service of 285 in.². It collapses with just one hand and sets up with a lift and lock system- plus the included push-button ignition means you won't be fumbling around with matches. One buyer who was in the market for a portable propane grill that could connect to the propane supply of his recreational vehicle says that he was able to set it up with a little bit of tinkering with connection hoses and brass fittings. Some buyers had trouble with the lid flailing open during transport, especially over rough terrain, so it's best to use a little bit of bungee cord to secure it. Buyers say that while it can survive outside for short periods of time, over the long-haul it's best to store it- since it folds up so compactly many reviewers tuck it away in the garage. Some buyers use it as their dedicated grill, especially when they don't have a ton of outdoor space to work with-especially for small patios, balconies, and verandas. In order to make cleanup easier, some purchasers lined with burner area with aluminum foil, cutting circular holes out to fit around the circular burners. The third portable propane gas grill we examined was the stainless steel Smoke Hollow option- it provides 305 in.² of cooking surface with a 12,000 BTU burner. It is a table top option built from a durable stainless steel and intended for outdoor grilling on camping, boating, tailgating, picnic expeditions, and even functioning as a replacement for traditional grills. It's intended to be used in conjunction with disposable propane cylinders-these can easily be purchased in camping supply stores as a common accessory purchase. Buyers have told us that fits up to 8 burgers at a time with even heat distribution. As an alternative to charcoal grilling, campers say that this is a lighter weight option that is more conveniently portable. There have been some reports of the ignition lighter malfunctioning right out of the box. 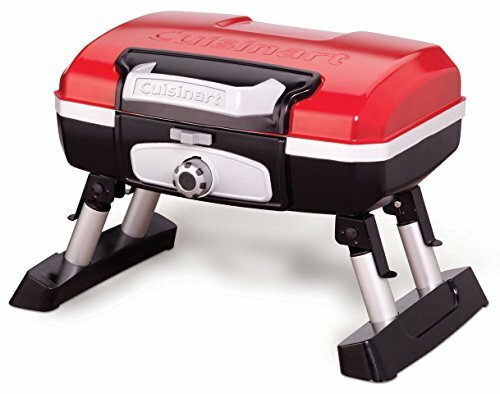 The fourth gourmet portable tabletop gas grill we examine is manufactured by Cuisinart and it comes in red, black and stainless steel options either with a stand or as a table top. It provides 145 in.² of grilling area, enough to accommodate 8 steaks, 8 burgers, 4 pounds of fish, or between 6 to 10 chicken breasts. It includes an integrated briefcase style handle which enables you to carry this 13.5 pound gas grill to your car and out into the wilderness without too much of a hassle. It's marketed as a space-saving option that evenly cooks food as well as traditional-style grills. Cuisinart additionally markets it as a high-performance option great for families- whether you are taking it to a baseball game or on to your boat, its collapsing legs and carry handle makes it simple to transport. In terms of supplying propane, you can purchase a screw the tank at places like Walmart and Home Depot, or you can purchase a hose to hook it up to a larger, dedicated propane tank (Source). Some hesitant purchasers wondered whether you can cook with the top down, and reviewers have told us that indeed this model let you do that- a solid option for cooking hamburgers and kebabs. While not as strong as a traditional grill, we were told that it is a strong option that will take a little bit extra time to cook hotdogs and steaks. Some buyers purchased it to install outside their homes, having it function as a backup cooking area- great for when you need an extra cooking surface for large family get-togethers. The last mobile gas grill we examined his the Weber Go Anywhere option- it produces 6,500 BTU with a 160 in.² cooking surface area. It includes porcelain enamel cooking grates that are engineered to decrease nasty flame flares- designed to provide high-range temperatures as well as low-range temperatures great for slower, more absorbing grilling. Buyers were for the most part unhappy with this option, with some reviewers purchasing expensive add-ons to improve its heat distribution and clean-up, saying that it's not worth it; you should just purchase a more robust unit to start with. Other complaints include legs that bend and get misshapen over time resulting in an insecure and wobbly grilling experience. Other buyers complain about the quality of the broiler plate that covers the burner and that the regulator is inadequate for delivering sufficient pressure so that the burner remains lit. Other buyers say that overall this is more of a broiler pan than an actual grill- with the evident drawback being that it doesn't get hot enough to actually function as a broiler. In addition, because of a poor design, reviewers have told us that all of the melted juice and fat from meat drip and disgustingly collect inside of the grill's body frame creating an intractable and disgusting mess.